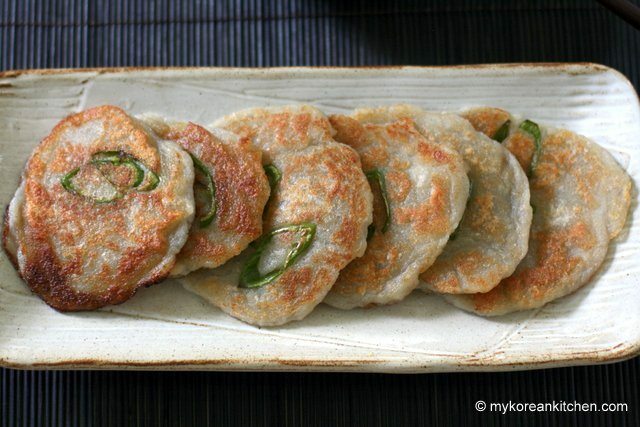 Learn how to make Korean potato pancakes. It’s a perfect rainy day snack! It’s been a very hot sizzling summer season this year. I’ve been wishing for decent heavy rain, and my wish was granted late last week. But perhaps I should have specified how much rain and how long I wanted it for. It’s been miserably raining with the strong wind constantly blowing for around 5 days in a row and now I am wishing for the sunny blue sky again. Will you please come back soon? Blowing tree branches and constant rain drops woke me up this morning. As soon as I opened my eyes, I knew I had to have some pancakes. But what do I have in my fridge and pantry that doesn’t need me to go out to fetch fancy ingredients? I had two potatoes, some onions and green chillies on hand. 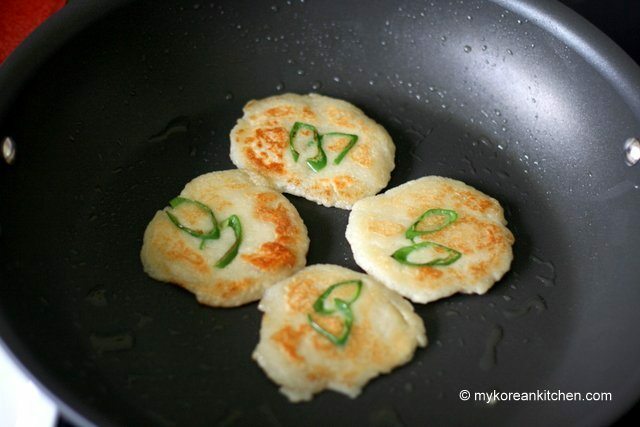 Then it was easily determined that I am going to make some Gamja Jeon: 감자전 (Korean potato pancakes). Do you have any food you crave on a rainy day? What’s your craving food? Below are a few theories about it. When a pancake is cooked in a pan, it makes a sizzling noise. Apparently, people associate this sizzling noise with the sound of rain drops. Do you? When we don’t get to see the sun (like on a rainy day) the melatonin level increases in our body, and it makes us feel a bit depressed. 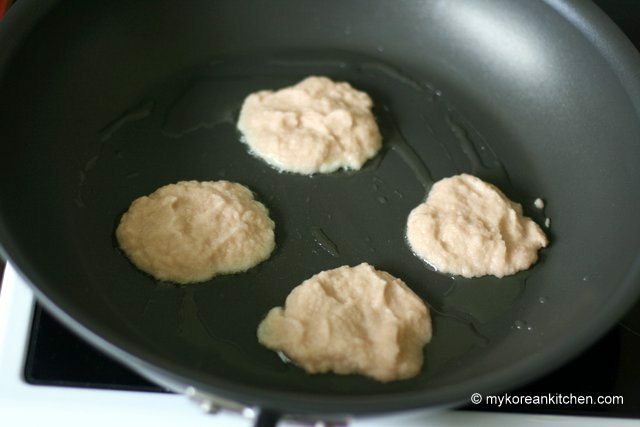 So our body wants us to increase the sugar level by eating some carbohydrates, and Koreans happened to choose pancakes. Probably that’s because our mum made pancakes for us on a rainy day and our brain remembers this! P.S. 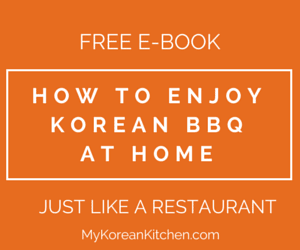 Check out more fabulous Korean rainy day foods from here! 1. 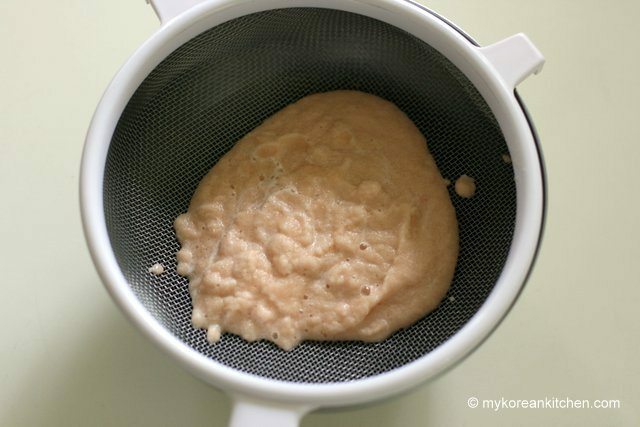 Blend the potato in a mixer or food processor. 2. Strain the water from the pureed potato by letting it sit on a bowl for about 5 mins. 3. Blend the onion in a mixer or food processor. 4. Mix the pureed potato and onion in a bowl. Add some salt. 6. Heat the pan on high heat and add some oil. 7. Once the pan is heated, scoop out the potato mixture and place it onto the pan. Reduce the heat to medium-high. 8. (optional step) Once one side of the pancake is about 70-80% cooked, garnish with the chilli. 9. When one side of the pancake is completely cooked, turn it over. Lightly press it with a spatula to flatten a bit. 10. 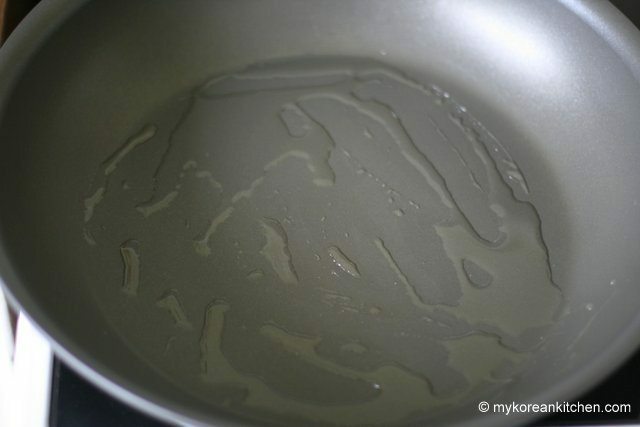 When the other side of the pancake is completely cooked, turn it over again to see whether it is cooked through. Also, if you prefer crispy golden pancakes, cooking them both sides twice is not a bad idea as long as you don’t burn them. 11. 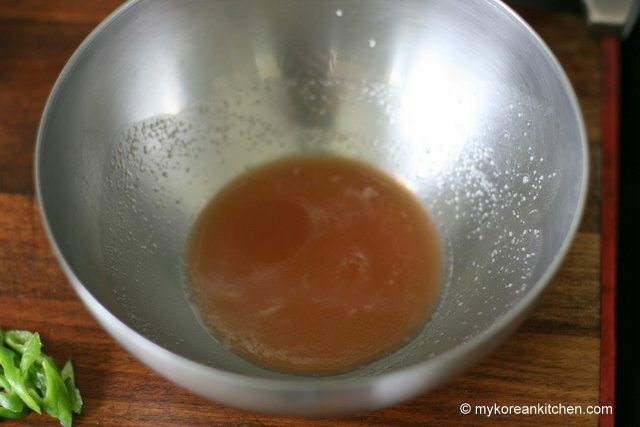 Serve warm with some Korean pancake sauce. 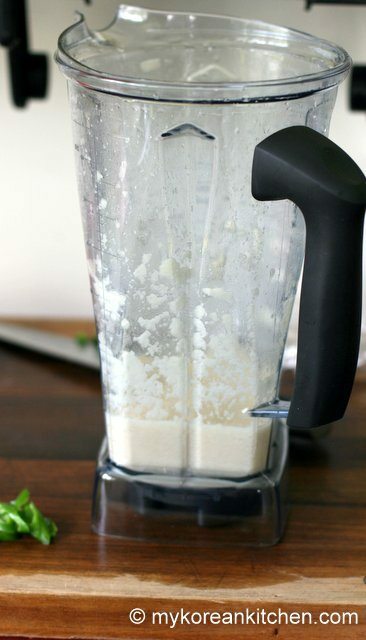 Blend the potato in a mixer or food processor. Strain the water from the pureed potato by letting it sit on a bowl for about 5 mins. 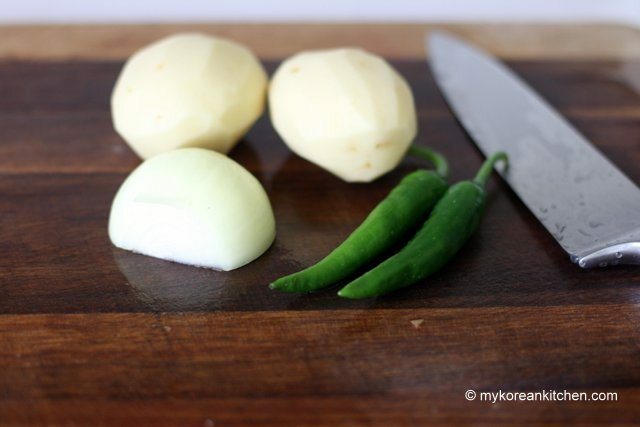 Blend the onion in a mixer or food processor. 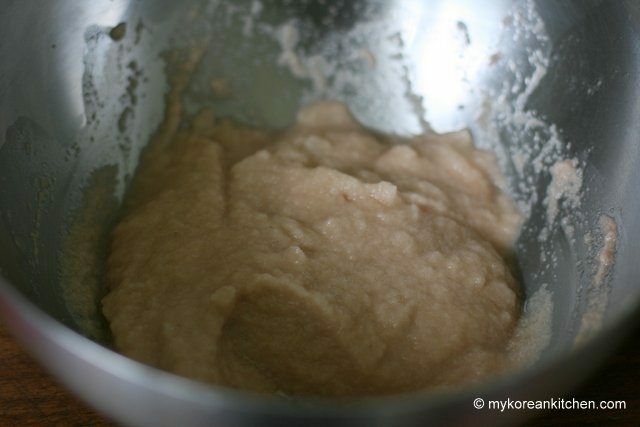 Mix the pureed potato and onion in a bowl. Add some salt. Heat the pan on high heat and add some oil. Once the pan is heated, scoop out the potato mixture and place it onto the pan. Reduce the heat to medium-high. (Optional step) Once one side of the pancake is about 70-80% cooked, garnish with the chilli. When one side of the pancake is completely cooked, turn it over. Lightly press it with a spatula to flatten a bit. When the other side of the pancake is completely cooked, turn it over again to see whether it is cooked through. Also, if you prefer crispy golden pancakes, cooking them both sides twice is not a bad idea as long as you don’t burn them. 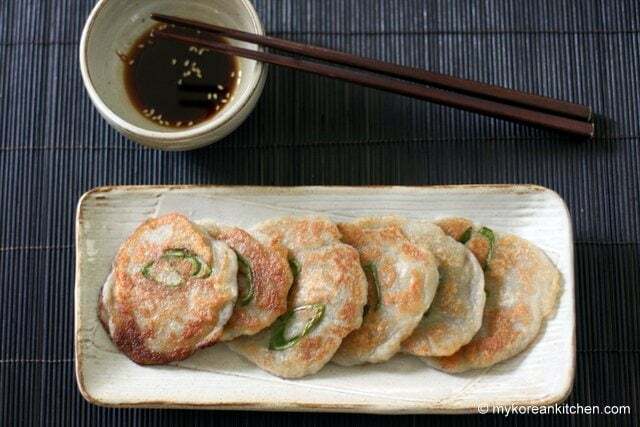 Serve warm with some Korean pancake sauce. Hi Riah, What kind of frying pan are you using? A non-stick pan might work better. (I’m saying this even though I’m a huge fan of cast-iron skillet!) Also, are you adding enough cooking oil? Finally, check whether your pancake is too thick or too large to flip without breaking it. Hope this helps! i sue ill be glad to make this recepies for my new friend Kim she korienne with my brother so she my sister in law yes……so ill make these potato pankake for sure to impress her she so nice person.thank you for all your nice recepies . 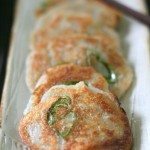 You say korean potato pancakes? It is the same as belorussian potato pancakes, draniki. The only difference is that we don’t put chili! We eat these with sour cream, but I think these is tasty without any souces. 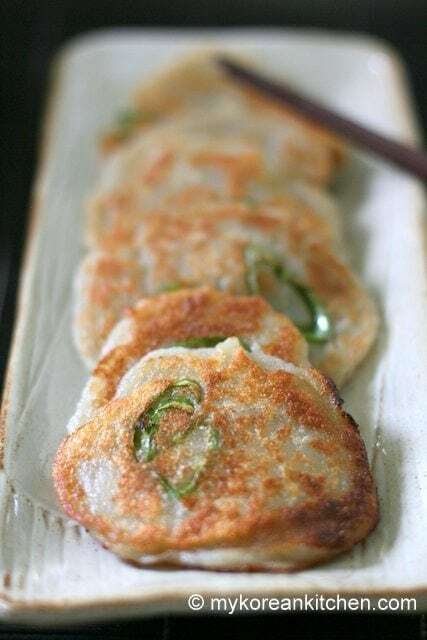 I don’t know whether Korean potato pancake is made the same way as Belorussian potato pancake or not as I’ve never heard of it until you mentioned. 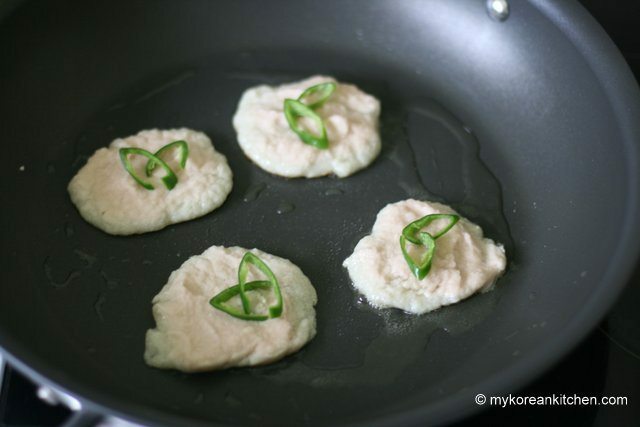 Regardless, I call this Korean potato pancake because this is how Koreans make it in Korea. Miss 11 and I just made these for lunch (we are homeschoolers and studying South Korea at the moment) and WOW! These were so very, very, good. We didn’t have any fresh chili’s in the house so we used a bit of capsicum, but still they were sensational and Miss 11 has added them to the list for future lunches and next time with chili as we both love it! Thanks so much … off to search your site for more recipes to try. 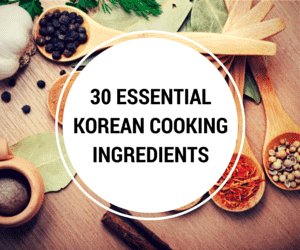 We normally only do one recipe for each country we study but these were so good we want to try even more Korean foods. Hi Lisa, I’m so happy to hear you and your daughter enjoyed my potato pancake recipe! What a great idea of making each country’s dish as you study about them! Just finished making and eating these delicious potatoe pancakes. I’d like to pre make the potatoe mix and throwing it in a pan for a quick snack throughout the day, I wanted to know if you’d recommend pre making the grated potatoe mix and storing it in the fridge. 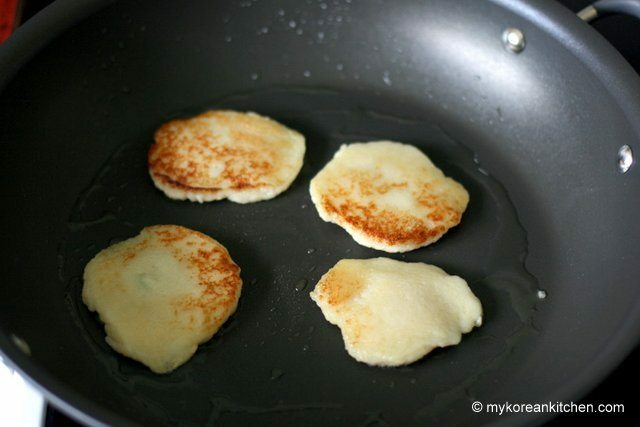 Hi Pauline, Glad to hear you enjoyed your first Korean potato pancakes! I think it is best to make the grated potato mix as you need it, mainly because of the potato discolouring issue. Also I read somewhere that when the potato is prepared a long time before cooking it, it might not be as crispy. Thank you for this recipe. However, I am confused with set 5. What is the water in the bowl that needs to be emptied? Is that the water that was drained when you let the blended potato sit for 5 mins? Or is there water in the bowl after you mix the potato with onion? Also, what starch is there? I don’t see that as an ingredient, so where does this come from? Is it liquid or a powder? Is it left behind in the bowl after mixing with the onion, or is it part of the water that is drained out? Any clarification would help out. I will try to make it anyways and maybe I will find out after trying. Hi Konan, Thanks for your questions. I just updated my instruction #5 and I hope it is clearer now. The water is from step 2 – that is the water drained when you let the blended potato sit for 5 mins. Also when you empty this water out, you will see some powdery residue in the bottom of the bowl. That is the potato starch I’m referring to. I have Korean Beef Short Ribs in my slow cooker right now and I’m going to make these as the side! I cannot wait! 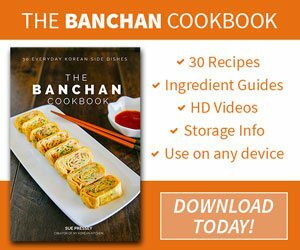 I love your blog and I use it frequently because my newest passion is Korean food. I was searching for a starch for dinner tonight and found this recipe. So, I probably will make these for dinner but, this is just like a German potato pancake that I used to eat growing up. Everything was grated (mom didn’t have a blender) and then they were served with fresh applesauce and usually a pork chop. Thanks for tweaking my memories and helping to expand my palette with your tasty blog. Thanks Ellyn! It’s always interesting to hear about other cuisine and how they sometimes resemble similarities to one another. 🙂 I hope you enjoy following my blog. If you use a grater instead of a blender, wouldn’t the texture be different as to what you did? Would the steps after still be the same? Hi Marie, I would think the texture would be different. I guess it comes down to how finely can you grate the potatoes. It should be crunchier I would think since the particle is larger. Whether you use a grater or a blender the rest of steps should be the same. Alright! Thanks! Will try it out! No, you don’t boil the potatoes at all for this recipe. You only need to grate or blend the potatoes (per step 1). Hope it turns out well!! is it possible to use yams or another type of potato? Oh I’d love this! I like how you added the diagonally cut green onion on the pancakes. So cute! Is there a specific dipping sauce that goes along with the potato pancakes? However, if you like to make something different, please refer the below link for dipping sauce. You are always welcome to share your cooking photo via facebook or twitter if you like. I hope you enjoy it. These look so delicious! I must try and make them! When you make this, let me know. I would love to see it!